Computer simulation is the key to comprehending and controlling the full-scale industrial plant used in the chemical, oil, gas and electrical power industries.Simulation of Industrial Processes for Control Engineers shows how to use the laws of physics and chemistry to produce the equations to simulate dynamically all the most important unit operations found in process and power plant. 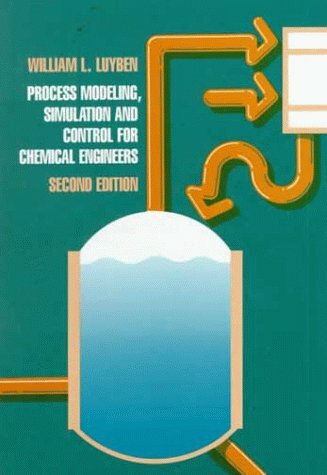 The book explains how to model chemical reactors, nuclear reactors, distillation columns, boilers, deaerators, refrigeration vessels, storage vessels for liquids and gases, liquid and gas flow through pipes and pipe networks, liquid and gas flow through installed control valves, control valve dynamics (including nonlinear effects such as static friction), oil and gas pipelines, heat exchangers, steam and gas turbines, compressors and pumps, as well as process controllers (including three methods of integral desaturation).The phenomenon of markedly different time responses ("stiffness") is considered and various ways are presented to get around the potential problem of slow execution time.The book demonstrates how linearization may be used to give a diverse check on the correctness of the as-programmed model and explains how formal techniques of model validation may be used to produce a quantitative check on the simulation model's overall validity. The material is based on many years' experience of modelling and simulation in the chemical and power industries, supplemented in recent years by university teaching at the undergraduate and postgraduate level.Several important new results are presented.The depth is sufficient to allow real industrial problems to be solved, thus making the book attractive to engineers working in industry.But the book's step-by-step approach makes the text appropriate also for post-graduate students of control engineering and for undergraduate students in electrical, mechanical and chemical engineering who are studying process control in their second year or later. 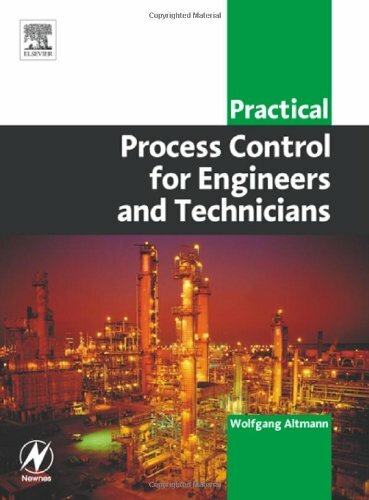 Excellent reference book for chemical engineers involved in process control design. 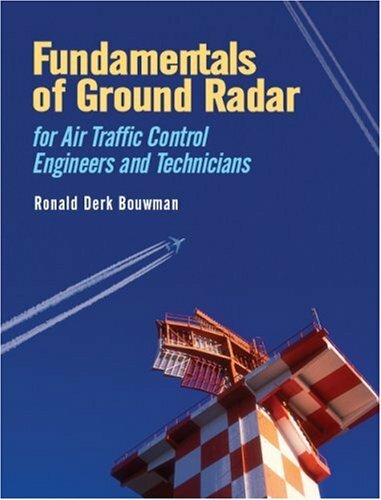 Where the author is most familiar is with general control concepts, e.g., ratio control, split-range control, cascade control. Where he is less successful is where controls are applied. Currently, I am involved in a process involving crystallizers. An experienced crystallizer engineer with 40 years experience glanced at this section and cried, "Posh." Then, again, he is a bit skeptical. Looking at it myself, I found a few generalities but still managed to create a workable control scheme with the help of some reference information from an AIChE course run by Wayne Genck and Tim Nordahl (my skeptic). In the crystallizer section, chapter 8.18, he defines seven variables and three equations allowing for four degrees of freedom. This is a concept key to this reference. The seven variables include: temperature and flow of the feed; temperature and flow of the cooling or heating medium; level of supersaturation (critical variable in crystallization); ratio of mother liquor recycled; and removal/dissolution rate of fine crystals. Fines must be removed or re-dissolved in the solvent: the goal is large, inclusion-free crystals. Four degrees of freedom means that four loops should be used to control these variables. Any more than that and the process is over-constrained with the result that the loops will interfere with each other. 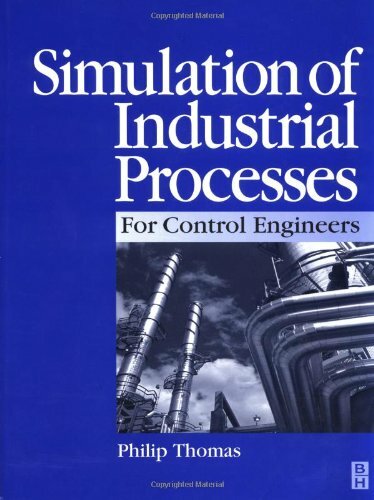 By working through the background information and with the help of Shinskey's "Process Control Systems," I was able to use Liptak's handbook to develop what should be a robust control system. This handbook includes sections on PLCs, DCS - and integration with other systems, programming, valve hardware, fieldbus, sizing control valves, etc. Unlike other reference books, it is possible to buy Volume II without Volume I. Volume I seems to refer to instrument set-up. I have a couple of other instrument handbooks but this looks to be superior to the others. If this review was helpful, please add your vote. Thanks. The purchase was so eacy and reliable. Another outstanding work by Bela Liptak! The second volume of Bela Liptak's "Instrument Engineers' Handbook" series is another phenomenal piece of work.Written to help newly-minted engineers come up to speed with practical applications in industry, it is a masterpiece of technical content and outstanding readability.My review covers the third edition of this book which is not the latest edition, although from what I have seen of Liptak's references throughout the years subsequent editions just keep getting better. My two-year Instrumentation students use this book as a primary reference for their studies in control algorithms and final control elements.The fact that my students (who are not being trained as engineers, but technicians) find this book of significant value to their learning is a testament to its writing quality.While some of the sections delve into mathematics well beyond my students' abilities (e.g. Differential equations, Laplace Transforms, Nyquist plots -- all subjects appropriate for readers at the engineering level), there is enough content within its 1500+ pages still accessible and relevant enough to their learning that I have used this as the primary text for my courses on control valves, PID, and process optimization. 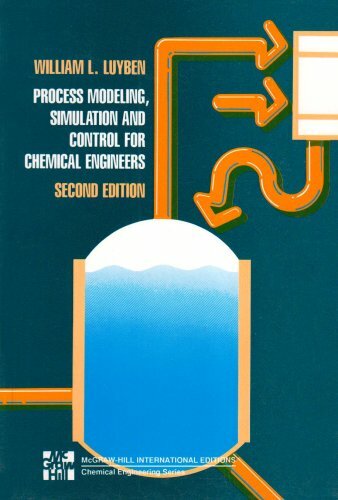 One of the unique features of this volume is a chapter (number 8 in the third edition) found near the end of the book entitled "Process Control Systems. 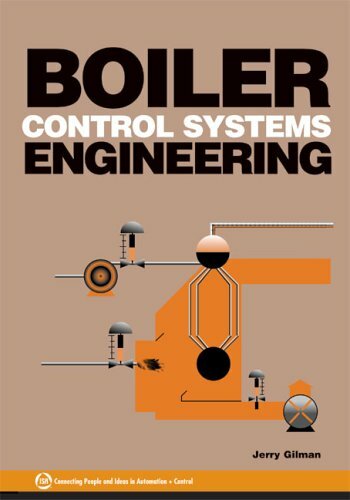 "The subject of this chapter is the application of process control strategies to a varietry of common industrial processes (HVAC, boilers, chillers, compressors, heat exchangers, distillation columns, evaporators, pumps, chemical reactors, turbines, water treatment, etc. ).This chapter alone would be worth the price of the book, with practical insight on the best strategies to apply to various processes, and why they work. If I had anything negative to say about this book, it is that writing style betrays its collective authorship.All of the "Instrument Engineers' Handbook" volumes are collective works, with chapters written by different authors.Bela Liptak serves as the editor-in-chief in these volumes.As such, style and presentation varies a bit from chapter to chapter.This should not discourage anyone from buying the book, though.It is a must-have for any professional in the field of industrial instrumentation and automation. Absolutely the Very Best Process Control Reference for the Process Control Engineer - Now Updated and Expanded !!. This is the second volume of the Instrument Engineer's Handbook, and. 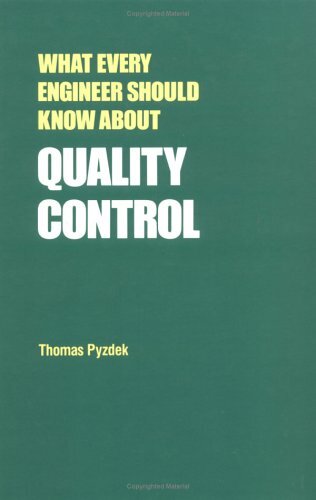 as its title suggests, it deals with Process control and Optimization, covering everything from Control Hardware, Control Theory, Control Strategies, and the Control and Optimization of Specific Unit Operations. 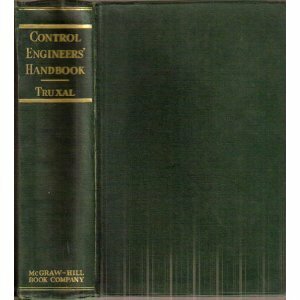 The Chapters on Control Hardware cover in detail transmitters, controllers, control valves, regulators and other types of final control elements, PLCs, and other logic devices, human interfaces and displays, including the design of control rooms. 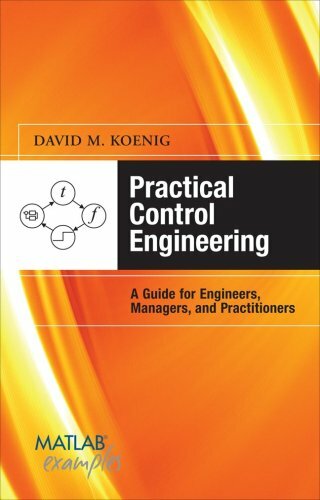 The Chapters on Control Theory and Control Strategies covers everything from control basics and PID controllers, to tuning methods, stability, process characteristics, process modeling and simulation, model-based control, genetic and other evolutionary algorithms, fuzzy logic programming, neural networks and other advance control strategies. 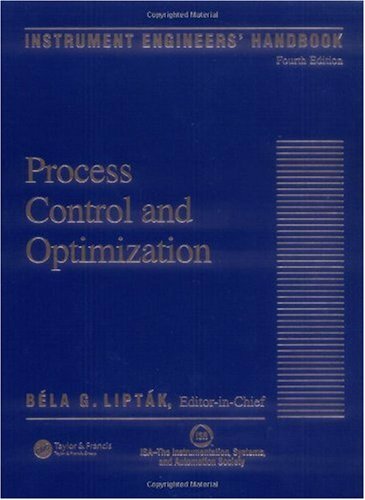 The Chapters on Control and Optimization of Unit Operations provide both in-depth of both the theory of operation and control, and practical implementation for the control of pumping, distillation, chemical reaction, heat transfer and many other. - Before we can control a process, one must fully understand it. - Being progressive is good, but being a guinea pig is not. Therefore is the wrong control strategy is implemented, the performance of even the most advanced digital hardware will be unacceptable. - And Instrumentation, Automation, and Process Control Engineer or Technician is doing a good and better job by telling plant management what they need to know, and not what they like to hear. - If an instrument is worth installing, it should also be worth calibrating and maintaining. No device can outperform the reference against it was calibrated. - Trust your common sense not the sales literature. Independent performance evaluation based on the recommendation of international and national users associations should be done before installation, and not after it. I am an Industrial Practitioner of Process Measurement & Control. I have been working in the Process Industries for more than 16 years as an Automation, Instrumentation, Process Safety and Process Control Engineer. 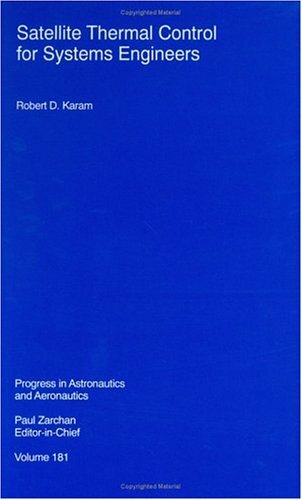 I consider this book to be the very best reference in the field for anyone and everyone working in these areas or in areas related with their Industrial applications. You will find this handbook useful, either if your work is related with the engineering, maintenance or operation of Process Control Systems. If you are a beginner to Process Control, you may also want to consider "Process Dynamics, Modeling, and Control (Topics in Chemical Engineering)" by Babatunde A. Ogunnaike, which is an excelent introductory reference to Chemical Processes Dynamics and Control. 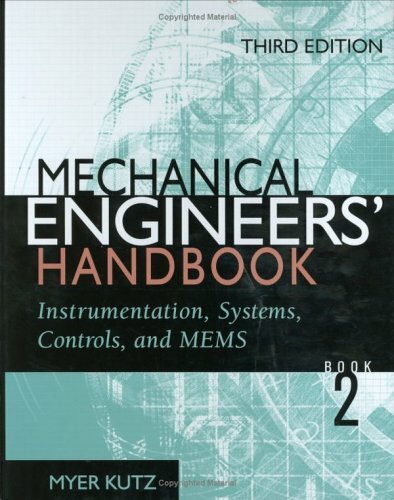 Mechanical Engineers' Handbook has a long tradition as a single resource of valuable information related to specialty areas in the diverse industries and job functions in which mechanical engineers work. This Third Edition, the most aggressive revision to date, goes beyond the straight data, formulas, and calculations provided in other handbooks and focuses on authoritative discussions, real-world examples, and insightful analyses while covering more topics that in previous editions. Book 2: Instrumentation, Systems, Controls, and MEMS is comprised of two major parts, conveniently put together because feedback control systems require measurement transducers. The first part covers instrumentation, including transducer design, strain gages, flow meters, digital integrated circuits, and issues involved in processing transducer signals and acquiring and displaying data. by Lewin Edwards Lewin Edwards is an embedded engineer with over 15 years experience designing embedded systems hardwarefirmwareand control software. Edwards does the reader a great service by going into why decisions are made. For example, Edwards leads you through the choice of which PC motherboard he was going to use for the project. His decisions and considerations were very insightful to me. Although the board(s) selected are now out of date according to the manufacturers, using his process will enable you to find motherboards to be able to handle the tasks in the book. Next, Edwards leads you through setting up Linux using BusyBox and how to divide the system up using a compact harddrive and a CompactFlash. All in all, while I consider myself an expert linux user, I found his coverage of material very interesting. Another keeper for my robotics bookshelf. 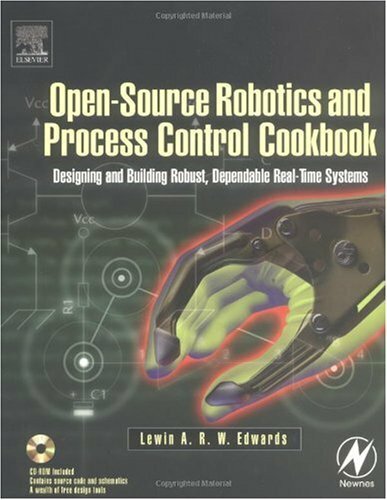 Edwards claims that his book is the first on using open source software to build robotic systems. The aim is to reduce the cost, as compared with using a commercial real time operating system. Hitherto, the latter has been the choice of many robotics designs. He puts a lot of detail into the text, of how to use linux as the embedded operating system in the robot. To address the issue of whether linux is up to the demands of real time running. The ideal reader should be proficient both in linux device drivers and in constructing robots. The text is probably not ideal for someone new to either field. The second volume of this work continues the and approach of the first volume, providing mathematical tools for the control engineer and examining such topics as random variables and sequences, iterative logarithmic and large number laws, differential equations, stochastic measurements and optimization, discrete martingales and probability space. It includes proofs of all theorems and contains many examples with solutions. 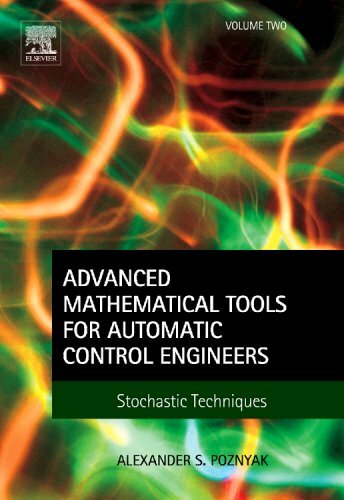 It is written for researchers, engineers and advanced students who wish to increase their familiarity with different topics of modern and classical mathematics related to system and automatic control theories. It also has applications to game theory, machine learning and intelligent systems. This book is good as a supplement to someone who already knows the subject matter; its style may be discouraging for many starters since many details are not provided, maybe because of its size. Additionally, the book suffers many production errors that can affect its readability. Many symbols are used in equations without proper definitions, and there are numerous typographical errors that can be of concern to the reader; for example, in 24 in section 2.3 it mentions integration of equation 2.18, while actually equation 2.18 is on page 28, section 2.6. Unfortunately, there is no list of errata, so use it with care. Good for culture, not for analysis ! 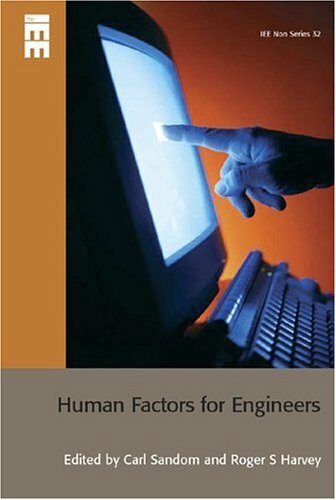 If you like ODE's in the context of engineering applications, this book is for you. Unfortunately, if you're interested in analyzing and modeling some practical dynamic system, this is probably of no use. 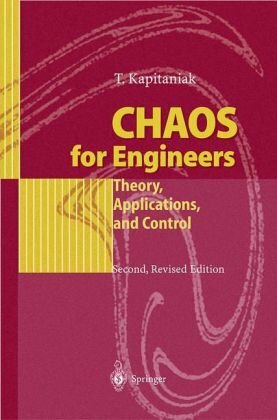 It mainly describes systems for which there are already known closed-form equations describing the dynamics, and shows where and why chaos comes from. It may help you if you're dealing with a mechanical system that can be easily modelled by a set of ODE's but it is not analytic enough to be useful for poeple involved into modeling and analysis of a completely new dynamic system for which no equations already exist. For people interested in time series analysis whith chaotic looking data, please don't skip the exceptionnal : "Nonlinear Time Series Analysis" from Kantz and Schreiber ! This is an absolutely amazing book : if you need one book for helping you to analyze your data, this one will do the job ! The author provides a full-range of cost options on how to prevent EMI: from inexpensive enclosures that are adequate for many situations to the most advanced shielding techniques used in scientific applications. This unique book will show the reader how to select the most suitable technique for the application: something that will do the job, yet avoid expensive and time-consuming "overkill." 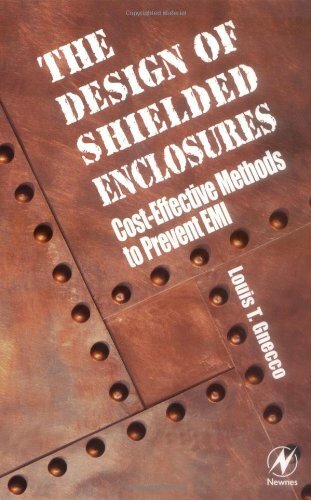 Design of Shielded Enclosures provides a variety of practical techniques that will reveal how well an enclosure is working without a lot of expensive and time-consuming tests. This book will also show how to determine when detailed testing is necessary. *Get quick, effective, and economical solutions to pressing engineering problems that are halting delivery, stopping production and costing money.